Lakhmir Singh & Manjit Kaur kaur Solutions for Class 10 Science Chapter 5 Refraction Of Light are provided here with simple step-by-step explanations. These solutions for Refraction Of Light are extremely popular among class 10 students for Science Refraction Of Light Solutions come handy for quickly completing your homework and preparing for exams. All questions and answers from the Lakhmir Singh & Manjit Kaur kaur Book of class 10 Science Chapter 5 are provided here for you for free. You will also love the ad-free experience on Meritnation’s Lakhmir Singh & Manjit Kaur kaur Solutions. All Lakhmir Singh & Manjit Kaur kaur Solutions for class 10 Science are prepared by experts and are 100% accurate. If a ray of light goes from a rarer medium to a denser medium, it will bend towards the normal. If a ray of light goes form a denser medium to a rarer medium, it will bend away from the normal. When a beam of light travelling in a rectangular glass slab emerges into air, it bends away from the normal. When a beam of light travelling in air enters water, it bends towards the normal. When a ray of light travelling in water enters air, it bends away from the normal. 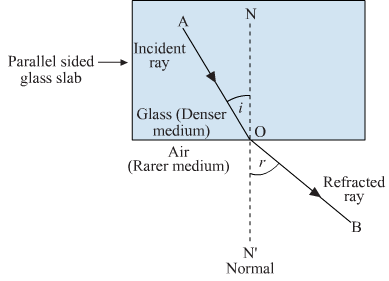 When a ray of light travelling in air is incident on a parallel side glass slab, it bends towards the normal. We know that glass is a denser medium and air is a rarer medium. When a ray of light travels from a denser medium to a rarer medium, it bends away from the normal. So, the ray will bend away from the normal in the given case. A ray of light travelling in air enters obliquely into water. Does the ray light bend towards the normal or away from the normal? Why? We know that air is a rarer medium and water is a denser medium. When a ray of light goes from a rarer medium to a denser medium, it bends towards the normal. So, the light ray will bend towards the normal in the given case. When a ray of light travels from a denser medium (water) to a rarer medium (air), it bends away from the normal. Therefore, the ray of light will bend away from the normal in the given case. 1. An object placed under water appears to be raised. 2. A stick held obliquely and partly immersed in water appears to be bent at the water surface. This is due to the refraction of light. When a ray of light passes from air into glass, it bends towards the normal. So, the angle of refraction is smaller than the angle of incidence. (a) Explain why, a stick half immersed in water appears to be bent at the surface. Draw a labelled diagram to illustrate your answer. (b) A coin in a glass tumbler appears to rise as the glass tumbler is slowly filled with water. Name the phenomenon responsible for this effect. (a) When a stick is half immersed in water, it appears to be bent at the surface due to the refraction of light. 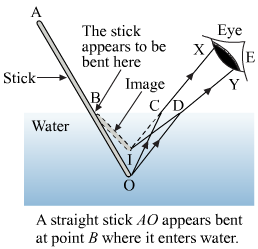 In the above figure, the half portion BO of stick AO is immersed in water and it appears to be bent at point B. The light ray OC coming from the lower end O of the stick passes from water to air and gets refracted away from the normal in the direction CX. Another ray OD is refracted in the direction DY. These two refracted rays, i.e, CX and DY meet at point I, when produced backwards. The point I is nearer to the water surface than point O. Therefore, a virtual image of end O of the stick is formed as I. So, human eye at position E sees the end O at I; i.e., stick appears to be bent. (b) A coin in a glass tumbler appears to rise as the glass tumbler is slowly filled with water. It occurs because of refraction. (a) With the help of a labelled diagram, explain why a tank full of water appears less deep than it actually is. (b) Name the phenomenon due to which a pencil partly immersed in water and held obliquely appears to be bent at the water surface. (a) Refraction of light causes a tank full of water to appear less deep than it actually is. Suppose, we have a tank of water as shown in the following figure. Here, we take a point O at the bottom of the tank. We see this point because of the light rays coming from it. Now, a light ray OA from point O passes through water and enters air at point A. It gets refracted away from the normal in the direction AX. Similarly, another ray OB gets refracted at point B and bends away from the normal in the direction BY. These two refracted rays, i.e., AX and BY, meet at point I on producing them backwards. This point I (nearer to the water surface than O) is the image of point O. Therefore, point O appears to be nearer at position I. Similarly, this can be applied to all points on the bottom of the tank. This causes the tank to appear less deep than it actually is. 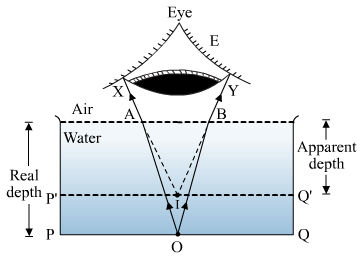 (b) It is the phenomenon of refraction due to which a pencil partly immersed in water and held obliquely appears to be bent at the water surface. 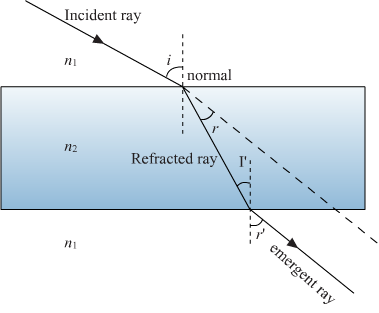 (a) With the help of a diagram, show how when light falls obliquely on the side of a rectangular glass slab, the emergent ray is parallel to the incident ray. (b) Show the lateral displacement of the ray on the diagram. (c) State two factors on which the lateral displacement of the emergent ray depends. (a) In the following figure, a light ray travelling in air is incident on the rectangular glass slab. It gets refracted and bends towards the normal. Again, a change in the direction takes place when the refracted ray travelling in glass emerges into air. Here, the light ray bends away from the normal. We see that the incident and emergent rays are parallel to each other. These rays are parallel because the extent of bending on the opposite and parallel faces of slab is equal and opposite. 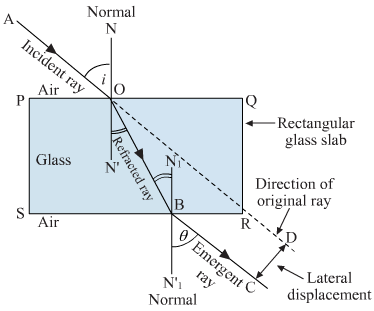 (b) The perpendicular distance between the original path of the incident and emergent rays coming out of the glass slab is called lateral displacement of the emergent ray. It is shown in the above figure. 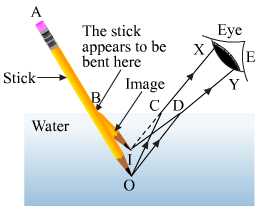 In the above figure, the portion BO of the pencil AO is immersed in water and it appears to be bent at point B. The light ray OC coming from the lower end O of the pencil passes from water to air and gets refracted away from the normal in the direction CX. Another ray OD is refracted in the direction DY. These two refracted rays, CX and DY, meet at point I, when they are produced backwards. Point I is nearer to the water surface than point O. Therefore, a virtual image of end O of the pencil is formed as point I. So, human eye at position E sees the end O at point I; i.e., pencil appears to be bent. If water is replaced by another liquid, which is optically denser than water, the bending of pencil will increase because an optically denser medium causes more refraction or more bending of light rays. We know that air is a rarer medium and glass is a denser medium. When a ray of light goes from a rarer medium to a denser medium, it bends towards the normal. So, the light ray will bend towards the normal in the given case. Glass is denser than water; therefore, if light rays pass from water into glass, the rays will be refracted towards the normal. The speed of light in an optically rarer medium is more than the speed of light in a denser medium. Now, air is an optically rarer medium and glass is a denser medium. Therefore, light rays will travel fast in air. Refraction of light causes the water to appear shallower than it really is. The refraction of light is due to the change in the speed of light on going from one medium to other. The speed of light ray slows down in denser materials. The bending of light, when it passes from one medium to another, is known as refraction. It occurs due to the change in the speed of light on going from one medium to another. (a) Light travelling along a normal is ...............refracted. (a) Light travelling along a normal is not refracted. (b) Light bends when is passes from water into air. We say that it is refracted. The change in direction of light when it passes from one medium to another obliquely is called refraction of light. Here, the light ray changes its direction or refracts at point A when it travels from air to glass. 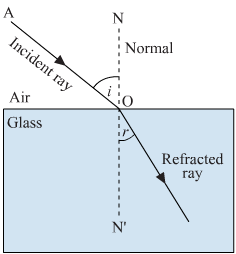 The ray changes its direction again at point B when it travels from glass to air. Here, light ray changes its direction or refracts at point A when it travels from air to glass. 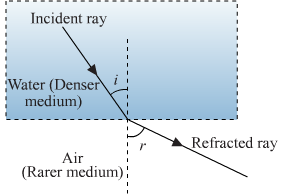 The ray changes its direction again at point B when it travels from glass to air. The final direction of light ray, i.e., BX will be parallel to the direction OAY in which it enters the glass block. (a) from air into an optically denser medium. (b) from an optically denser medium into air. NN' is the normal at the point of entry. (b) BC shows the path of light ray through the glass block and CD shows the path on the other side of the glass block. What is meant by the 'angle of incidence' and the 'angle of refraction' for a ray of light? 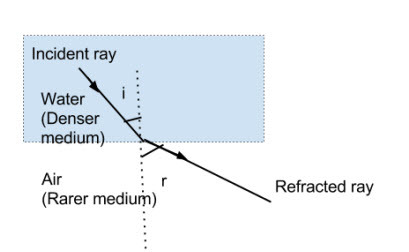 Draw a labelled ray diagram to show the angle of incidence and the angle of refraction for a refracted ray of light. The angle between the incident ray and the normal is called angle of incidence. The angle between the refracted ray and the normal is called angle of refraction. (a) Which is optically denser : water or glass? (b) If a ray of light passes from glass into water, which way will it bend : towards the normal or away from the normal? (a) Glass is optically denser as compared to water. (b) If a ray of light passes from glass to water, it will bend away from the normal because glass is a denser medium as compared to water. 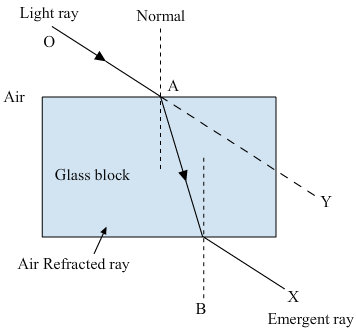 (b) if it hits the glass block at an angle other than 90° (that is, obliquely to the glass block). When a light ray passes from air into glass, what happens to its speed? Draw a diagram to show which way the ray of light bends. When a ray of light travels from a rarer medium to a denser medium (air into glass), its speed decreases and it bends towards the normal. When a ray of light travels along the normal incident on the surface, it is not refracted. Because when a light ray passes from denser medium to a rarer medium, it bends away from the normal. Because when a light ray passes from a rarer medium to a denser medium, it bends towards the normal. Because if a ray of light goes form a denser medium (glass) to a rarer medium (water), it bends away from the normal. When a ray of light travels along the normal incident on the boundary separating two mediums, it is not refracted. If a ray of light travels along the normal, it is not refracted. 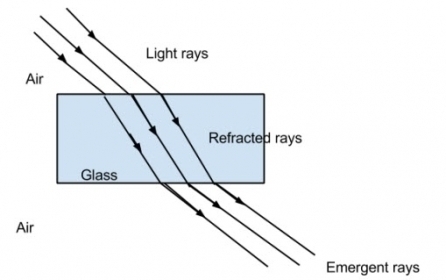 Diagram E shows that the ray of light is refracted correctly. When a light ray goes from a rarer medium to a denser medium, it bends towards the normal. This principle is replicated in this diagram. .
(a) What is the angle of incidence? (b) What is the angle of refraction? (a) Angle of incidence is 00 because light ray is travelling along the normal and angle of incidence is the angle between the light ray and the normal. (b) If the incident ray falls normally on the surface, no bending of light ray takes place. So, the angle of refraction is also 00. In case of reflection, the angle of reflection is equal to the angle of incidence. On the other hand, in case of refraction, the angle of refraction is not equal to the angle of incidence. (a) to produce a large amount of bending? (b) for no refraction to happen? 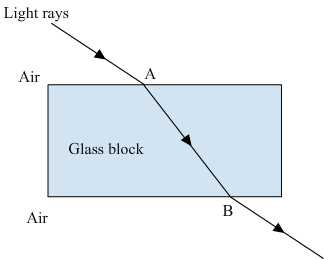 (a) To produce a large amount of bending, the light ray has to enter the glass with a large angle of incidence. 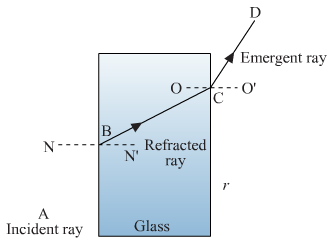 (b) For no refraction, the light ray has to enter the glass perpendicularly. (a) How can you bend light away from the normal? (b) How must light travel out of a substance if it is not going to be refracted? (a) We can bend light away from the normal by making the light to enter from a denser medium to a rarer medium. (b) Light will not refract if it travels at the right angles to the surface of the substance. When a beam of light rays enters the glass block, it gets refracted. It bends towards the normal. Also, when these light rays leave the block, they bend away from the normal. 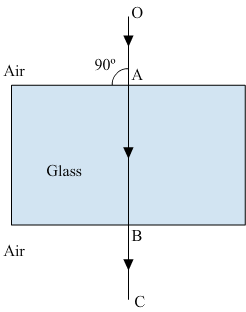 When light rays fall normally on the surface of the glass block, there is no bending of rays; the rays travel straight. When a beam of light enters glass at an angle, the speed changes and therefore the direction of light changes; i.e., bending of light occurs. When a beam of light falls at right angles to the surface of glass, all parts of light waves reach the glass at the same time, enter the glass at the same time and hence slow down at the same time. Due to this no change in direction of light takes place; i.e., bending of light does not take place. The ratio of sine of angle of incidence to the sine of angle of refraction is a constant value. This value is called the refractive index of a medium. The relationship between the angles of incidence and refraction is given by Snell's law. According to this law, the ratio of the sines of the angles of incidence and refraction is constant for a given pair of media. Sine of angle of incidence (i)Sine of angle of refraction (r)=constant (n )This constant is known as refractive index. What is the speed of light in a medium of refractive index 65 if its speed in air is 3,00,000 km/s? Speed of light in the given medium = ? The refractive index of glass is 1.5. Calculate the speed of light in glass. The speed of light in air is 3.0 × 108 ms−1. Speed of light in glass = ? Refractive index of water = ? Thus, the refractive index of water is 1.33. 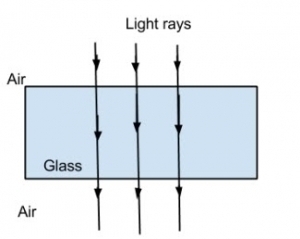 (a) State and explain the laws of refraction of light with the help of a labelled diagram. (b) What is meant by the refractive index of a substance? (c) Light travels through air at 300 million ms−1. On entering water it slows down to 225 million ms−1. Calculate the refractive index of water. (i) The incident ray, the refracted ray and the normal to the interface of two transparent mediums at the point of incidence, all lie in the same plane. (ii) The ratio of sines of angles of incidence and refraction is a constant, for the light of a given colour and for a given pair of mediums. This law is also known as Snell’s law of refraction. Here, 1n2 is the refractive index of medium 2 with respect to medium 1. Here, mediums 1 and 2 are air and water, respectively. Therefore, refractive index of water is 1.33. According to this formula, speed of light will be maximum in a substance whose refractive index is minimum. Therefore, speed of light will be maximum in substance S whose refractive index is 1.31. The refraction in a material depends on its refractive index. Refractive index is calculated by sin isin r.
This ratio is maximum for material C; therefore, it produces maximum refraction. Refractive index is a ratio of two similar quantities (the sines of angles); therefore, it has no units. The refraction index of glass is higher than that of water. We know that a denser medium has high refractive index. Glass is denser than water; therefore, it has high refraction index. Carbon disulphide is optically denser than ethyl alcohol. It is because a substance with high refractive index is optically denser than the other with low refractive index. The refractive index of diamond is 2.42. This means that the ratio of the speed of light in air (or vacuum) to that in diamond is equal to 2.42. The refractive index is the ratio of speeds of light in the two mediums. 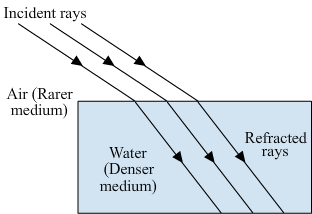 The refractive index of medium 2 with respect to medium 1 is equal to the ratio of speeds of light in medium 1 and in medium 2. When a ray of light goes from air into a clear material, you see the ray bend. How much the ray bends is determined by the refractive index of the material. Three examples of materials that refract light are glass, water and air. The speed of light rays changes when they enter these materials. According to Snell's law, the ratio of sines of the angles of incidence and refraction is constant for a given pair of mediums. This constant is called refractive index. Refractive index, n = ? Thus, the refractive index of glass is 1.60. 1n2 is 32; therefore, 2n1 will be 1/32. 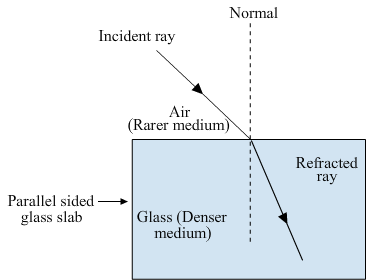 Therefore, refractive index of light going from glass to air will be 4/6. The angle of incidence is equal in all the cases; therefore, the refractive index will be maximum in the case of minimum angle of refraction. According to this argument, medium C will have minimum angle of refraction because it has maximum refractive index. The value of (Sin i) is same in all the cases; therefore, the value of (Sin r) will be maximum for minimum refractive index. This means that the angle of refraction will be maximum for minimum refractive index and substance S has minimum refractive index. Speed of light in the medium is slowest; therefore refractive index will be maximum as the speed of light in air is constant. Thus, light will travel slowest in the substance with refractive index 1.63. (1) Light speeds up as it travels from a denser medium to a rarer one, ie., from a medium with a higher refractive index to one with a lower refractive index. An example would be the medium pair of diamond and water, where light travels from diamond to water. (2) Using the same argument, light slows down as it travels from a medium with a lower refractive index to one with a higher refractive index. Therefore, the medium pair of crown glass and ruby can be taken as an example, where light moves from the crown glass to the ruby. Since the speed of light in vacuum is a constant, the refractive index becomes inversely proportional to the speed of light in a medium. (1)The speed of light is maximum in a medium that has the lowest refractive index, ie., medium A . (2) The speed of light is minimum in a medium that has the highest refractive index, ie., medium D.
A convex lens can concentrate the sun's rays to a point and burn a hole in a piece of paper. The usual name for a point inside a lens through which light passes undeviated is the optical center . The height of the image formed is 1 cm. The reason being, when an object is placed at a distance of 2f from a convex lens, the size of the image formed is equal to the size of the object . If the image formed by a convex lens is of the same size as that of the object, what is the position of the image with respect to the lens? The image will be formed at a distance of 2F from the lens and behind it. For an object placed at the focus of a convex lens, the image is formed at infinity. The object should be placed at a distance that is less than F(focus) of the lens. The resultant image is virtual, erect and enlarged and formed on the same side as the object. From this theory, a convex lens can therefore, be used as a magnifying glass. The object should be placed between the optical centre and the focus of a convex lens to obtain a virtual, erect and magnified image. The object should be placed between f and 2f of a convex lens to obtain a real, inverted and magnified image. (a) With the help of a labelled diagram explain how a convex lens converges a beam of parallel light rays. 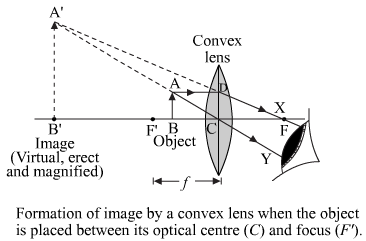 Mark the principal axis, optical centre, principal focus and focal length of the convex lens on the diagram. (b) State whether convex lens has a real focus or a virtual focus. (c) List some things that convex lens and concave mirror have in common. (a) Suppose that a parallel beam of light rays falls on a convex lens as shown in the figure. These light rays are parallel to one another and also to the axis of the lens. The incident rays pass through the convex lens and get refracted according to the laws of refraction. All the rays, after passing through the convex lens, converge at the same point F, on the other side of the lens. The point F is called the principal focus of the convex lens. Thus, the point of convergence of the parallel beam of light rays to a single point is called the focus of the lens. (b) A convex lens has a real focus because all the light rays actually pass through the focus. Both converge a parallel beam of light rays to a single point called the focus. Both form real and inverted images of an object, except in one case. Both form a virtual, erect and magnified image when the object is placed between the pole and focus of a convex mirror, and between the centre of the lens and the focus, for a concave lens. When an object is placed beyond 2F, the image formed is real and diminished. The image will be formed at the focus. 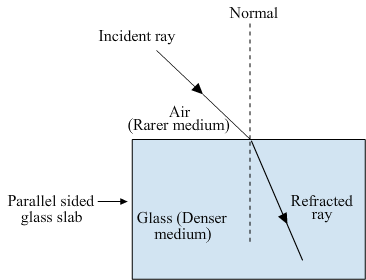 The ray will pass through the focus after refraction since it is parallel to the principle axis. See the diagram given below. For a magnifying glass, we use a convex lens. The object should be placed between the optical centre and the focus. (1) They are used in telescopes. (2) The convex lenses are used in magnifying glasses.They are used in the glasses of those affected with long-sightedness. (b) The image in a convex lens depends upon the distance of the ........... from the lens. (a) Parallel rays of light are refracted by a convex lens to a point called the focus. (b) The image in a convex lens depends upon the distance of the object from the lens. What is a lens? 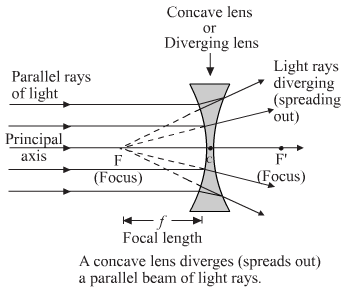 Distinguish between a convex lens and concave lens. 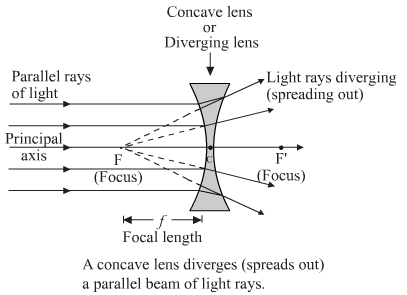 Which of the two is a converging lens : convex lens of concave lens? A lens is an optical device that transmits and refracts a ray of light, and converges or diverges a beam of light. 1.A convex lens converges or concentrates the light rays to a point. 2.A convex lens has a real focus. 3.A convex lens has a positive focal length. 1. A concave lens diverges the rays passing through it. 2.A concave lens has a virtual focus. 3.A concave lens has a negative focal length. A convex lens is a converging lens . (a) Explain with the help of a diagram, why the convex lens is also called a converging lens. (b) Define principal axis, principal focus and focal length of a convex lens. A convex lense is outwardly curved and causes the light to pass through it and converge or concentrate to a point. Think of a magnifying glass that is used to burn something. The light that passes through it concentrates to a point, and this convergence is used to burn things. See the diagram given below. (b) An imaginary line that passes through the optical center and the center of curvature of both faces of the lens, and is perpendicular to the faces is known as the principal axis. Focus is a point on the principal axis where all the rays that are parallel to the principal axis meet after refraction from the lens. The focal length may be defined as the distance between the optical centre and principal focus of the lens. (a) Explain with the help of a diagram, why the concave lens is also called a diverging lens. 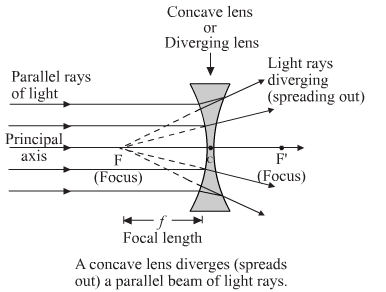 (b) Define the principal focus of a concave lens. 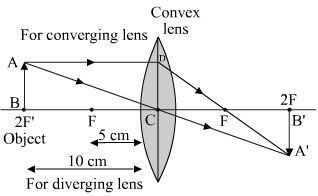 (a) A concave lense is curved inwards. Light passing through it diverges or spreads out. Think of a flashlight. The light from the small bulb passes through the lens and spreads out into a bigger beam on the other side. See the diagram given below. (b)​ The principle focus of a concave lens is a point on the principle axis where all the reflected rays parallel to the principle axis appear to diverge. A convex lens forms a real and magnified image when an object is placed between F and 2F. (1)Nature of image – real and inverted. (2)Size of Image – same size as that of object​. (a) What type of lens is shown in the diagram on the right? What will happen to the parallel rays of light? Show by completing the ray diagram. (b) You eye contains a convex lens. Why is it unwise to look at the sun? (a) It's a convex lens. The light rays will converge at a point called the focus of the lens. 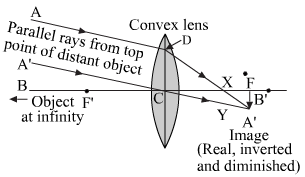 (b) A convex lens converges a beam of light rays at a point called the focus. Therefore, it is unwise to look at the sun as it may damage the eye. (a) real, inverted and smaller than the object? (b) real, inverted and same size as the object? (c) real, inverted and larger than the object? (d) virtual, upright and larger than the object? (a) To form a real, inverted and smaller image than the object, the object should be beyond 2F . (b) To form a​ real and inverted image, which is the same size as that of the object, the object should be at 2F. (c) To form a real, inverted and larger image than the object, the object should be between F and 2F. (d) To form a virtual, upright and larger image than the object, the object should be between F(focus) and the optical centre. A lens with a short focal length is used so as to obtain greater magnification. To determine the focal length of a convex lens, place the convex lens in a holder and keep it in front of a distant object like a tree. A cardboard screen is put behind the lens. Now, change the distance of the screen from the convex lens until a clear, inverted image of the tree is formed on the screen. Measure the distance of the screen from the lens. This distance will be the focal length of the convex lens. Here, we have used the fact that the image of an object at a far distance is formed at the focus of a convex lens. (a) With the help of a labelled diagram, explain how a concave lens diverges a beam of parallel light rays. 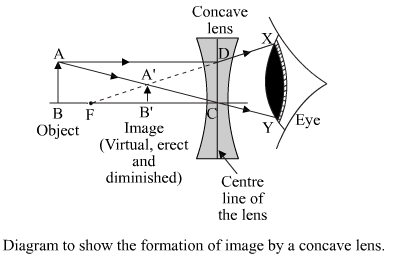 Mark the principal axis, optical centre, principal focus and focal length of the concave lens on the diagram. (b) State whether concave lens has a real focus or a virtual focus. (c) List some things that concave lens and concave mirror have in common. (a) When a parallel beam of light rays falls on a concave lens, the rays spread out (or diverge) after passing through the lens (figure). Since the refracted rays are diverging away from one another, they do not actually meet at a point. The diverging rays, when produced backwards appear to meet at a point F called the principal focus, on the left side of the lens. (b) A concave lens has a virtual focus because the light rays do not actually pass through the focus. Both diverge a parallel beam of light. Both form a virtual image at all times. Both have a virtual focus. (b) between F1 and the optical centre O of the lens. (a) When an object is placed at 2F1 , the image so formed by the convex lens is at 2F. This image is real, inverted and of same size as the object as shown in the figure. (b) When the object is placed between F1 and the optical centre O of the lens, the image formed by the convex lens is behind the object (left of the lens). This image is virtual, magnified and erect as shown in the figure. Case (b) is used as a magnifying glass. The reason being, the image of an object that is placed between F1 and the optical centre is virtual and magnified, which is the requirement of a magnifying glass. (a) An object is placed well outside the principal focus of a convex lens. Draw a ray diagram to show how the image is formed, and say whether the image is real or virtual. (b) What is the effect on the size and position of the image of moving the object (i) towards the lens, and (ii) away from the lens? (a) When an object is placed well outside the principal focus of a convex lens, the image formed is real and inverted as shown in the figure. (i) When an object is moved towards the lens, the size of the image starts increasing. The position of the image starts moving away from the lens and towards infinity (on the right side of the lens) till the object is placed at the focus. When the object is moved closer to the lens, the image is formed behind the object (left side of the lens). This image is virtual, erect and magnified in size. (ii) When the object is moved away from the lens, the image so formed moves closer to the lens and gets diminished in size. (a) Explain what is meant by a virtual, magnified image. (b) Draw a ray diagram to show the formation of a virtual magnified image of an object by a convex lens. In your diagram, the position of object and image with respect to the principal focus should be shown clearly. (c) Three convex lenses are available having focal lengths of 4 cm, 40 cm and 4 m respectively. Which one would you choose as a magnifying glass and why? (a) A virtual image is an image formed by a lens/mirror that cannot be taken on a screen. A magnified image implies that the size of the image formed is larger than the size of the object. (b) When an object is placed between the focus and the optical centre of a convex lens, the image formed is virtual and magnified as shown in the figure. (c) We will choose the lens with a focal length of 4 cm as the image formed will be more magnified (the smaller the focal length of a lens, the higher will be the magnification). (a) Explain why, a real image can be projected on a screen but a virtual image cannot. (b) Draw a ray diagram to show the formation of a real diminished image of an object by a convex lens. In your diagram, the position of object and image with respect to the principal focus should be shown clearly. (c) Name one simple optical instrument in which the above arrangement of convex lens is used. (a) A real image can be projected on a screen unlike a virtual image because a real image is formed by the actual meeting of light rays. A virtual image, on the other hand, is not formed by the actual meeting of light rays. (b) When an object placed is beyond 2F', the image formed by the convex lens is real and diminished, as shown in the figure. (c) A camera works on the above arrangement because the camera lens produces a small, real and inverted image of an object on the film. since the image of an object placed between the focus and the optical centre of a convex lens is enlarged and virtual. since it is opaque and does not let light to pass through it. 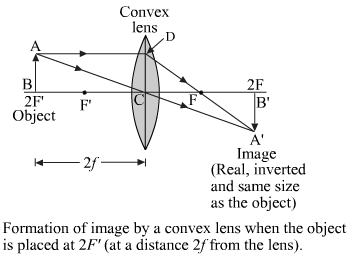 The reason being, a beam of light coming from the focus of a converging lens becomes parallel, after refraction from the lens. For an object placed between the focal length and twice the focal length of a converging lens, the image formed is real, inverted and magnified. The reason being, the image of an object placed between f and 2f of a convex lens is real, inverted and magnified. When an object is placed at the focus of a concave mirror (convex lens), the reflected (refracted) light rays are always parallel to each other and to the principal axis. For an object placed between F and 2F of a convex lens, the image formed is real and enlarged. As the object moves away from the lens, the image gets closer to the lens. A convex lens forms a real image at 2f on the right side of the lens. The size of the image is equal to that of the object if the object is placed at 2f. When an object is placed between F and the optical centre, the image of the object formed by convex lens is virtual, erect and magnified. This is because a convex lens produces an image of the same size as the object when the object is placed at 2f. Image distance v = ? Object distance u = ? Here, minus sign show that image is formed on the left side of the lens. We know that a converging lens forms an image of same size as object when object is placed at a distance of 2f from the lens. It is given that the image is smaller than the object if object is kept at a distance of 21 cm. Similarly, the image is bigger than the object if object is kept at a distance of 19 cm. Therefore, at 20 cm, the distance should be 2f. This means that the focal length is approximately 10 cm. (a) The object should be placed at 20 cm because a convex mirror forms a real, magnified image when an object is placed between f and 2f. (b) The object should be placed at 10 cm because a convex mirror forms a virtual, magnified image when an object is placed placed between f (focus) and the optic centre. (c) The object should be placed at 35 cm because a convex mirror forms a real, diminished image when an object is placed beyond 2f. (d) The object should be placed at 30 cm because a convex mirror forms a real image of the same size when an object is placed at 2f. (a) 10 cm from the lens? (b) 20 cm from the lens? (a) The image will be virtual and magnified. We know that a convex lens forms the image of the same size as that of the object when the object is placed at 2f. Thus, the focal length of the lens is 13 cm. In this case, the object is placed between the focus​ (f) and the optic centre. This position of the object results in the formation of a virtual and magnified image. (b) The image will be real and magnified because the object is placed between 2f and f.
(a) Draw a diagram to show how a converging lens focusses parallel rays of light? (b) How would you alter the above diagram to show how a converging lens can produce a beam of parallel rays of light. 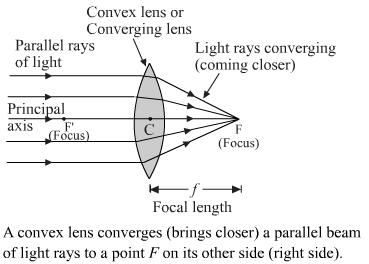 (a) When rays of light from a distant object pass through a converging lens, the light rays converge at the focus of lens (fig.). (b) When rays of light come from the focus of lens, the emergent rays of light get parallel to the principal axis. New Cartesian Sign Convention is used for measuring various distances in the ray diagrams of lenses. I. Object is always placed on the left of the lens; i.e., light must fall on the lens from left to right. II. 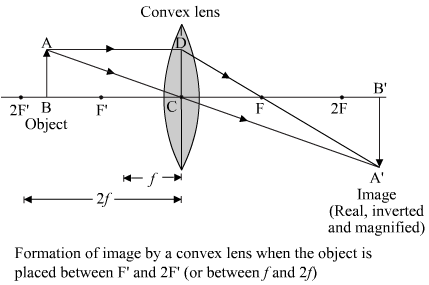 All distances parallel to the principal axis are measured from the optical centre of the lens. III. The distances along the direction of incident rays (along positive x-axis) are taken as positive, whereas the distances opposite to the direction of incident rays (along negative x-axis) are taken as negative. IV. Distances measured above the principal axis (along positive y-axis) are taken as positive. V. Distances measured below the principal axis (along negative y-axis) are taken as negative. Thus, the image is formed at a distance of 20 cm from the convex lens (on its left side). Only a virtual and erect image is formed on the left side of a convex lens. So, the image formed is virtual and erect. Because the value of magnification is more than 1, the image will be larger than the object. The positive sign for magnification suggests that the image is formed above principal axis. Thus, the height or size of the image is 8 cm. Thus, the image is formed at a distance of 15 cm behind the convex lens (on the right side). The value of magnification is negative; therefore, the image will be real and inverted. Thus, the focal length of convex lens is 33.3 cm. (i) The value of magnification is negative, therefore, the image will be real and inverted. (ii) The value of v is (+66.6 cm); therefore, the image is formed 66.6 cm behind the convex lens. Hence, focal length of the lens is 11.2 cm. In mirror formula, positive sign is present between the reciprocals of image distance and object distance . In lens formula, negative sign is present between the reciprocals of image distance and object distance. There is a difference of negative sign between the lens formula and the mirror formula. In mirror magnification formula, negative sign is present, whereas in lens magnification formula, this negative sign is not present. If the magnification produced by the lens is +3, the image will be virtual and erect. It is because if the magnification has a positive value, the image is always virtual and erect. If the magnification produced by the lens is -0.5, the image will be real and inverted. It is because if the magnification produced by a lens has a negative value, the image is always real and inverted. Therefore, the position of image will be at infinity. Thus, the image is formed at a distance of 30 cm from the convex lens. The plus sign for image distance shows that the image is formed on the right side of the convex lens. Only real and inverted image is formed on the right side of a convex lens; therefore, the image is real and inverted. Magnification 1 means that the image distance is the same as the object distance and the size of image is the same as the object. This happens only if the position of the object is at 2f, i.e, 2 × focal length. Thus, the object must be placed at a distance of 24 cm (2 × 12) from the converging lens. Object distance, u = ? Thus, to form a real image, the object should be placed at a distance of 6.6 cm from the lens. An object 5 cm high is held 25 cm away from a converging lens of focal length 10 cm. Find the position, size at nature of the image formed. Also draw the ray diagram. ⇒1v=1f+1u⇒1v=1f+1u⇒ 1v=110+1-25⇒ 1v=5-250⇒ 1v=350⇒ v=503=+16.6 cmThe image will be at a distance of 16.6 cm behind the lens. m=vu=503m=h,h=h,5h,5=-23 h,=-103=-3.3 cmThus, the image will be 3.3 cm high. It will be real and inverted. Thus, the object should be placed at a distance of 72 cm from the lens. Thus, the size of the image is 0.01 cm. So, the image is inverted (h' is negative), highly diminished (h' is smaller than h) and real (v is positive). When an object is placed beyond 2f, the image is real, inverted and diminished and is formed between f and 2f. Here, filament of the lamp acts as an object. Thus, the position of image is 0.40 m from the lens on the same side as the object (on the left of lens). Further, the value of magnification is positive; therefore, the image is virtual and erect. Therefore, the height of the image is 1.5 cm. The value of magnification is positive; therefore, the image is virtual, erect and three times magnified. Thus, the object must be placed at a distance of 7.5 cm in front of the lens. So, the slide is placed at a distance 22 cm from the poles of the lens. Converging lens is a convex lens. (b) State one practical application each of the use of such a lens with the object in position (i) and (ii). Hence, the image is real and inverted. According to lens formula: 1f=1v-1u⇒18=1v-1-6⇒18=1v+16⇒18-16=1v⇒3-424=1v⇒-124=1v ⇒v=-24 cmImage is at a distance of 24 cm in front of the lens; therefore, we have: Magnification (m)=vu m=-24-6 m=4 m=hiho ⇒ m= hi2 ⇒ hi=2×4 ⇒ hi=8 cmHeight of the image is 8 cm. Here, height is positive; therefore, image is virtual and erect. (c) The practical application for case (1) is that it can be used as a corrective lens for a farsighted person and for case (2), it can be used as a magnifying lens for reading purposes. (a) An object 3 cm high is placed 24 cm away from a convex lens of focal length 8 cm. Find by calculations, the position, height and nature of the image. (b) If the object is moved to a point only 3 cm away from the lens, what is the new position, height and nature of the image? (c) Which of the above two cases illustrates the working of a magnifying glass? Lens formula is given by:1f=1v-1u⇒18=1v-1-24⇒18=1v+124⇒18-124=1v⇒3-124=1v⇒224=1v ⇒ v=12 cm Image will be form at a distance of 12 cm on the right side of the convex lens.Magnification m=vu ⇒ m=12-24 ⇒ m=-12So, the image is diminished. Negative value of magnification shows that the image will be real and inverted. m=hiho-12=hi3 hi=-32 hi =-1.5 cm Height of the image will be 1.5 cm. Here, negative sign shows that the image will be in the downward direction. 1f=1v-1u⇒18=1v-1-3⇒18=1v+13⇒18-13=1v⇒3-824=1v⇒-524=1v⇒ v=-245⇒v=-4.8 cmThe image will be at a distance of 4.8 cm in front of the lens.Magnification (m)=vu ⇒ m=-4.8-3 ⇒ m=1.6 Positive value of magnification shows that the image is virtual and erect. m=hiho ⇒ 1.6=hi3 ⇒ hi=3×1.6 =4.8 cm Positive sign of the image shows that the image will be formed above the principal axis. 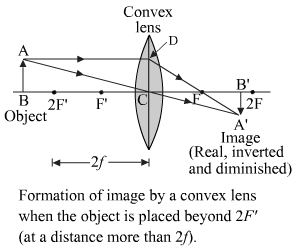 (c) Case (b) illustrates the working of magnifying lens as the object is between the focus and optical centre. 1f=1v-1u⇒120=1v-1-50⇒1v=120-150⇒1v=5-2100⇒1v=3100⇒v=1003 cmThe image will be at a distance of 33.3 cm on the right side of the mirrormagnification m=vum=33.3-50m=-0.66magnification is negative therefore image will be real and inverted. 1f=1v-1u⇒120=1v-1-25⇒1v=120-125⇒1v=5-4100⇒1v=1100⇒v=100 cm The image will be formed at a distance of 100 cm behind the mirrror.Magnification, m=vu ⇒ m=100-25 ⇒ m=-4Magnification is negative, which means the image is real and inverted. Substituting these values in the lens formula, we get:1f=1v-1u⇒120=1v-1-15⇒120=1v+115⇒120-115=1v⇒1v=3-460⇒1v=-160 v=-60 cmThe image will be formed at a distance of 60 cm in front of the mirror.m=vu⇒m=-60-15⇒m =4Magnification is positive; therefore, the image is virtual and erect. We can use case (ii) for a film projector. We can use case (i) for a camera. We can use case (ii) for a magnifying glass. (c) the mirror is concave but the lens is convex. (d) the mirror is convex but the lens is concave. According to the sign convention, the focal length for both a concave mirror and a concave lens is negative. The size of the image formed by a convex lens may be less than, equal to or greater than the size of the object . From the formula, it is clear that the magnification varies directly with the size of the image. The image formed by a concave mirror is always smaller than the size of the object. Therefore, the magnification of a concave mirror is always less than 1. In the case of a convex lens, for an object placed between F and 2F, the image formed will be real, inverted and enlarged. since the magnification is positive, the image formed is virtual, erect and enlarged. This is the case when an object is placed at a distance of less than f of the lens. When an object is placed at 2f, the size of the image formed will be equal to the size of the object. Therefore, we get a magnification of 1. (d) Beyond 2F: since the magnification is negative and less than 1, the image formed is real, inverted and diminished. Therefore, the object should be placed beyond 2F. the magnification is -2, which means that the image is real, inverted and magnified. A convex mirror forms a real, inverted and magnified image when an object is placed between F and 2F . A convex lens forms a virtual, erect and magnified image when an object is placed within the focus. For an object placed at a distance of 2F from a convex lens, the size of the image so formed is equal to the size of the object. ​For an object placed beyond 2f of a convex lens, the image formed is real, inverted and smaller than the object. (a) Rewrite the image distances in the correct order. (b) What would be the image distance if the object distance was 90 cm? (c) Which of the object distances gives the biggest image? (d) What is the focal length of this lens? (a) Since the focal length is a constant quantity, we have to pair the object distance(u) and the image distance (v) such that the focal length always comes out to be the same. From the above argument, we get the correct order of the image distance as 100 , 60 , 40 , 30 and 24. The reason being, as the object is carried far from a convex lens, the image is formed closer to the lens. The image distance will be 25.7 cm if the object distance is 90 cm. (c) The object distance of 25 gives the biggest image because at this position, the object is between f and 2f . We know that when an object is placed between f and 2f of a convex lens, we get a real, inverted and magnified image. (d) The image of an object at 2f is formed at 2f. This means that the pair of u and v that is equal in value gives us the value of 2f, which is 40. Hence, the value of f (focal length) is 402 . (a) What is the distance between the object and the lens? (b) Where should the object be placed if the image is to form at infinity? 25 cm and in front of the mirror. Therefore, the distance between the object and the image is 25 cm-16.66 cm = 7.14 cm. (b) The object should be placed at the focus for the image to be formed at infinity. Since the object distance is always negative, let it be -u. Since the focal length is positive for a convex lens, let it be +f . (i) Since object distance (u) is always negative, and the ratio vu here is negative, v must be positive, i.e., it is on the right side of the lens. --4u=15 u=-154Applying the lens formula:1f=1v-1u 1f=1-3u-1u 1f=-43u f=3u-4=3×-1544=4516=2.81 cmHence, the focal length of the lens is +2.81 cm. Distance of object from the lens (u) = ? Focal length of the lens (f)= ? 10u=-2050 10u=-2050 u =-52x10 ∴ u = -25 cm. It is a concave lens because only a concave lens forms a diminished and erect image of the object at all times. The rays will diverge and appear to meet at the focus of the lens. The image formed by a concave lens is always virtual because it is formed on the left side of the lens. Let us take an object AB beyond the focus (f) as shown in the figure. The image A'B' is formed on the left side of the concave lens and is therefore, virtual. The image is upright. Also the height of A'B' is less than the height of AB. Therefore, the image is diminished. (a) anywhere between optical centre and infinity. 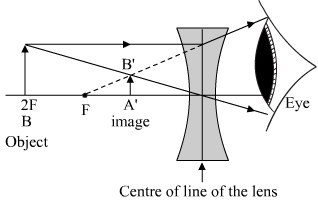 (a) In the case of a concave lens, when an object is placed anywhere between the optical centre and infinity, the image is formed between the optical centre and the focus. The image formed is virtual, erect and diminished. (b) In the case of a concave lens, when an object is placed at infinity, the image is formed at the focus. The image formed is virtual, erect and highly diminished. Which type of lens is : (a) a converging lens, and which is (b) a diverging lens? Explain your answer with diagrams. (a) A lens that converges a parallel beam of light passing through it to a point is known as a converging lens. The convex lens is a converging lens. The ray diagram below shows the parallel light rays converging at the focus of a convex lens. (b) The lens which diverges a parallel beam of light passing through it is known as a diverging lens. A concave lens is a diverging lens. The ray diagram below shows the parallel light rays getting diverged when passed through a concave lens. For an object placed anywhere in front of a concave lens, the image so formed is always virtual, erect and diminished in size. The position of the image is between the optic centre and the focus of the lens, as shown in the figure. How would a pencil look like if you saw it through (a) a concave lens, and (b) a convex lens? (Assume the pencil is close to the lens). Is the image real or virtual? (a) When a pencil is seen through a concave lens placed close to it, it appears smaller than it's actual size. Because a concave lens always produces a virtual image, the image formed is virtual. (b) When a pencil is seen through a convex lens placed close to it, the image so formed appears larger than it's actual size. The reason for this is, the pencil is placed within the focus of the lens and therefore, the image formed is virtual. (a) An object is placed 10 cm from a lens of focal length 5 cm. Draw the ray diagrams to show the formation of image if the lens is (i) converging, and (ii) diverging. (b) State one practical use each of convex mirror, concave mirror, convex lens and concave lens. A convex lens is used as a magnifying glass. A concave mirror is used as a shaving mirror. A convex mirror is used as rear view mirror in vehicles. A concave lens is used for correcting myopia. (a) Construct ray diagrams to illustrate the formation of a virtual image using (i) a converging lens, and (ii) a diverging lens. (b) What is the difference between the two images formed above? (a)(i) When an object is placed between the optic centre and the focus of a converging lens, the image formed is virtual, erect and magnified as shown in the figure. (a)(ii) When an object is placed anywhere between the optic centre and infinity of a converging lens, the image formed is virtual, erect, and diminished as shown in the figure. A diverging lens is used in spectacles to correct short-sightedness. A concave lens always forms a virtual, erect and diminished image. Both a concave mirror and a convex lens focus parallel light beams coming from a distant object onto the focus. (a) thinner in the middle than at the edges? (b) thicker in the middle than at the edges? 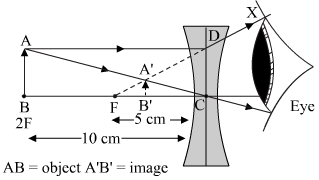 (a) A concave lens is thinner in the middle than at the edges. (b) A convex lens is thicker in the middle than at the edges. 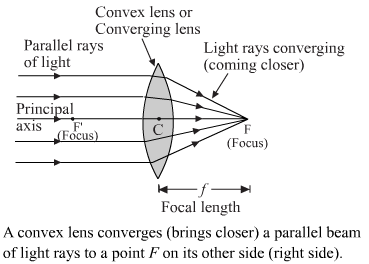 A ray of light passing through the focus of a concave lens will become parallel to the principal axis after refraction. (a) What type of images can a convex lens make? (b) What type of image is always made by a concave lens? (a) A convex lens can form two types of images: (i) real and inverted and (ii) virtual and erect. Real and inverted images are formed when an object is placed beyond the focus of the lens and virtual and erect images are formed when an object is placed between the focus and the optical centre. (b) A concave lens always forms a virtual and erect image. (a) A convex lens .................. rays of light, whereas a concave lens .................. rays of light. (b) Lenses refract light to form images: a..................... lens can form both real and virtual images, but a diverging lens forms only ...................... images. (a) A convex lens converges rays of light, whereas a concave lens diverges rays of light. (b) Lenses refract light to form images: a converging lens can form both real and virtual images, but a diverging lens forms only virtual images. It is a concave lens because only a concave lens forms a diminished image at all times. The beam of light is converging when it is coming out of the box; therefore, there should be a convex lens inside the box. This is because the emergent rays of light are diverging. A concave lens always forms a virtual image, smaller than the size of the object. (a) What is the focal length of lens A? (b) What is the focal length of lens B? (c) What is the nature of lens A? (d) What is the nature of lens B? (a) The focal length of lens A is 10 cm as only a converging lens forms a real, inverted, magnified image at great distance when object is placed at the focus of the lens. (b) The focal length of lens B is 5 cm as only a converging lens forms a real, inverted and same size image of object when the object is placed at 2F position of the lens. (c) Lens A is a converging (convex) lens as only a converging lens forms a real image. 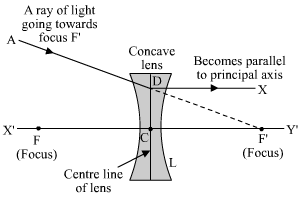 (d) Lens B is a converging (convex) lens as only a converging lens forms a real image. When the fork is seen through lens A, it appears to be diminished. Such diminished object is observed when it is placed near a concave lens. Therefore, lens A is concave, i.e., diverging in nature. When the fork is seen through lens B, it appears to be enlarged. Such enlarged image is formed by a convex lens when an object is placed between the lens and its focus. Therefore, lens B is a convex, i.e., converging in nature. (a) an inverted magnified image? (b) an erect magnified image? (c) an inverted diminished image? (d) am erect diminished image? (a) A convex lens can form an inverted magnified image. (b) A convex lens can form an erect magnified image. (c) A convex lens can form an inverted diminished image. 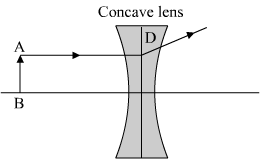 (d) A concave lens can form an erect diminished image. (a) What is the nature of lens A? (b) What is the nature of lens B? ​(a) Negative magnification shows that the image is real and inverted. Therefore, it's a convex lens. ​(b) Positive magnification shows that image is virtual and erect. The lens can be concave or convex in nature. However, a convex lens always forms a magnified virtual image. According to the given magnification, the size of the image is smaller than the size of the object. Therefore, the lens must be concave in nature. Since the object is at infinity, the image will be formed at the focus. The image distance will be equal to the focal length of the lens. Therefore, the focal length of the lens is 20 cm. Thus, the image is virtual and formed 3 cm away from the lens, on the left side. ⇒ 1-10-1u=115⇒ 1u=115-110⇒ 1u=2-330⇒ 1u=-130 ∴ u=-30 cm. The object should be place at a distance of 30 cm from the concave lens, and on the left side. Because the image is diminished and virtual, the lens is concave and diverging in nature. ∴ f = - 30 cm. Therefore, the focal length of the lens is 30 cm. The lens is diverging in nature because a negative focal length indicates a concave lens . ∴ u = - 60 cm. The negative sign shows that the object is on the left side of the concave lens. Therefore, the object is at a distance of 60 cm and on the left side of the concave lens. ∴ u = - 30 cm. The object is at a distance of 30 cm from the lens and on its left. Since the magnification is less than 1, the image is smaller than the object. Height of image h2 =? ∴ v = - 0.12 m = - 12 cm. The negative sign indicates that the image is formed on the left side of the lens. Therefore, the image is virtual. Here, the positive sign shows that the image is erect. Also, the size of the image is smaller than the size of the object and is diminished. Therefore, the image formed by the concave lens is virtual, diminished and erect. A concave lens has a focal length of 20 cm. At what distance from the lens a 5 cm tall object be placed so that it forms an image at 15 cm from the lens? Also calculate the size of the image formed. Therefore, the object is at a distance of 60 cm from the concave lens and on the left side of it. Magnification=image distanceobject distance=height of imageheight of object⇒vu=h2h1⇒-15-60=h25⇒h2=54=1.25 cm. Therefore, the size of the image is 1.25 cm. ∴ v = +60 cm. Therefore, the image formed is real. It is at a distance of 60 cm from the lens and to its right. The magnification is greater than 1. Therefore, the image is magnified. The negative sign shows that the image is inverted. ∴ v = - 8.57 cm. Therefore, the image formed is virtual. It is at a distance of 8.57 cm from the lens and to its left. The magnification is less than 1. Therefore, the image is diminished. The positive sign indicates that the image is erect. A concave lens is also known as a diverging lens. Height of the image, h2 = ? Therefore, the image is formed at a distance of 10.90 cm and to the left of the lens. The height of the image formed is 0.54 cm. Also, the positive sign of the height of the image shows that the image is erect. Image distance (v) = ? 1v-1u=1f⇒ 1v-1-20=1-40 ⇒ 1v+120=-140 ⇒ 1v=-140-120⇒ 1v=-1-240⇒ 1v=-340 ∴v =-403=-13.33 cm. Negative sign shows that the image formed is virtual and erect. Height of the image is 1.33 cm. 1v-1u=1f⇒ 1v-1-20=140 ⇒ 1v+120=140 ⇒ 1v=140-120⇒ 1v=1-240⇒ 1v=-140 ∴ v =-40 cm. h'=vux h h'=-40-20x 2=4 cm. (a) A small object is placed 150 mm away from a diverging lens of focal length 100 mm. (b) The diverging lens in part (a) is replaced by a converging lens also of focal length 100 mm. The object remains in the same position and an image is formed by the converging lens. Compare two properties of this image with those of the image formed by the diverging lens in part (a). (a)(i) The image formed by the lens is virtual, erect and diminished in size. 1v-1u=1f⇒ 1v-1-15=1-10⇒ 1v+115=-110 ⇒ 1v=-110-115 ⇒ 1v=-3-230⇒ 1v=-530 ⇒ v = -6 cm. Therefore, the focal length of the lens is 60 cm. Because a concave lens always forms a virtual image on the left side of the lens. Because both convex mirror and concave lens have positive magnification. (c) The lens is convex but the mirror is concave. Because both concave mirror and convex lens have positive magnification. (a) At what distance from the film should the lens be adjusted to obtain a sharp image of the flower? (b) What would be the diameter of the image of the flower on the film? (c) What is the nature of camera lens? Film should be adjusted at a distance of 6.66 cm behind the lens. Diameter of image, h' = ? (c) It is a convex lens. Focal length (f) = ? Negative sign of focal length shows that lens is diverging in nature. Hence, it is a concave lens. (a) State which type of lens is used. (b) Calculate focal length of the lens. (a) The image here can be taken on a screen. This means that the image is real. Further, we know that only convex lens forms a real image; therefore, a convex lens has been used here. Object distance (u) = ? Power varies inversely with the focal length. Lens A has a small focal length and hence, more power. The bending of light by a convex lens depends on the power of the lens. The more the power, the more the light bends. A convex lens having a short focal length will have more power and hence, a higher refraction. The power of a lens is a physical quantity with dioptre as it's unit. Define 1 dioptre power of a lens. (a) Convex lens has positive power. (b) Concave lens has negative power. A lens with a shorter focal length will have more power because power varies inversely with focal length . where, f is measured in metres and P in dioptres. A thick convex lens has more power than a thin one because it has greater curvature or lesser focal length than a thin lens. ∴ P =125×10-2 =10025= 4 D.
∴ P = 150×10-3 = 100050= 20 D.
∴​ P = 180×10-2 = 10080 = 1.25 D.
Negative sign indicates that it's a concave lens. Positive sign indicates it is a converging lens. Therefore, the lens is convex. Negative sign indicates it is a diverging lens. Therefore, the lens is concave in nature. ​(a) Positive power indicates it is a converging lens. Focal length of the lens is 2 m.
∴​ f = -66.67 cm. Since the power is negative, the lens is of a diverging nature. Therefore, it's a concave lens. Height of image h' = ? Focal length of the lens f = ? Thus, the image will be formed at a distance of 6 cm and in front of the mirror. or -6-15=h'4 h' =6 x 415 h' = 2415∴ h' =1.6 cm. Focal length, f = ? Image height, h' = ? Thus, the image is 8.5 mm long; it is also erect and virtual. The combined power is the algebraic sum of the individual powers of the lenses. Therefore, the power of the combination of the lenses is - 2.5 D.
P = 1f-2.5=1f∴f=-12.5 = -0.4 m = - 40 cm. Therefore, the focal length of the combination of the lenses is 40 cm. The negative sign shows that the combination of the two lenses causes it to behave like a concave lens. (a) The power of the combination of lenses is the algebraic sum of the powers of the individual lenses. ⇒ P = 4 - 10 = - 6 D.
(b) Suppose, the focal length of the combination of the lenses is f.
Therefore, the focal length of the combination of the lenses is - 16.7 cm. (c) The focal length of the combination of the lenses is - 16.7 cm. Here, the negative sign shows that the combination of the two lenses acts like a concave lens. Therefore, this combination of lenses is diverging. Let the power and the focal length of the lens Y be P2 and f2, respectively. The resultant power of the combination of two lenses is the algebraic sum of the powers of the individual lenses. The focal length of the lens Y is -60 cm. (b) The focal length of the lens Y is negative. Therefore, the lens is concave and diverging in nature. (a) The focal length of lens A is +20 cm. The positive sign indicates that lens A is convex, i.e., a converging lens. The focal length of lens B is -10 cm. The negative sign indicates that lens B is concave, i.e., a diverging lens. ∴ Power of lens A, PA=1fA=10.20=5 D.
∴ P​ower of lens B, PB=1fB=1-0.10=-10 D.
(c) When lenses are combined, the power of the combination is the algebraic sum of the powers of the individual lenses. P = 5 D - 10 D = - 5 D.
(a) What do you understand by the power of a lens? Name one factor on which the power of a lens depends. (b) What is the unit of power of a lens? Define the unit of power of a lens. (c) A combination of lenses for a camera contains two converging lenses of focal lengths 20 cm and 40 cm and a diverging lens of focal length 50 cm. Find the power and focal length of the combination.A optical instrument in which the above arrangement of convex lens is used is a convex lens used to burn paper by focusing sunlight. (a) The power of a lens is a measure of the degree of convergence or divergence of light rays falling on it. It is defined as the reciprocal of the focal length of a lens in metres. Therefore, the power of a lens depends on the focal length. (b) The unit for the power of a lens is a dioptre (D). One dioptre is the power of a lens whose focal length is 1 metre. Net focal length of the combination = 1net power=15.5=0.1818 m = 18.18 cm. (a) Two lenses A and B have power of (i) +2D and (ii) −4D respectively. What is the nature and focal length of each lens? (b) An object is placed at a distance of 100 cm from each of the above lenses A and B. Calculate (i) image distance, and (ii) magnification, in each of the two cases. Therefore, lens A is a convex lens as it has a positive focal length and lens B is concave as it has a negative focal length. 1v-1u=1f⇒ 1v-1-100=150⇒ 1v+1100=150⇒ 1v=150-1100⇒ 1v=2-1100⇒1v=1100 ∴ v = 100 cm. 1v-1u=1f ⇒1v-1-100=1-25⇒ 1v+1100=-125 ⇒ 1v=-125-1100 ⇒ 1v=-4-1100 ⇒ 1v =-5100 ∴ v =-20 cm. Negative sign shows that the image formed is virtual. Therefore, a lens with a small focal length will have more power. Power = 1Focal length=10.5 m=+2 D.
since power of lens = 1focal length=1-0.10=-10.0 D.
∴​ P = 110×10-2 = -10 D.
Negative sign indicates it is a diverging lens. Since the power is positive, the lens is convex in nature. ​(a) The reciprocal of the focal length in metres gives you the power of the lens, which is measured in dioptres. (b) For converging lenses, the power is positive while for diverging lenses, the power is negative. The powers of the lenses add up when brought in contact. So, net power = +6 D + (-10 D) = -4 D.
Because power of lens adds up when placed in combination. (a) Are these lenses thinner at the middle or at the edges? (b) Which lens has a greater focal length? (c) Which is the weaker eye? (a) These lens are thinner at the middle because they are concave lens. Further, concave lens has negative power. (b) Lens for right eye has greater focal length because power is inversely proportional to focal length. (c) Left eye is weaker because it has a correction with a lens of lower focal length. (a) State whether these lenses are thicker in the middle or at the edges. (b) Which lens bends the light rays more strongly? (c) State whether these spectacle lenses will converge light rays or diverge light rays. (a) These lenses are thicker in the middle because they are convex lens. (b) Power is inversely proportional to focal length; therefore, shorter focal length will mean strong bending. Hence, lens for left eye will bend light rays more strongly. (c) These spectacles will converge light rays because convex lens has positive power.